At the conclusion of a year of rigorous research to establish our benchmark institutions, diligent work by the strategic planning task forces, and collaboration among all constituencies, the College’s Board of Trustees approved our strategic framework in May 2017. The framework structures the initiatives proposed in response to the strategic questions posed by President Cornwell at the start of the 2016-17 academic year, undergirded by the three purposes of our strategic planning (strengthening the integrity of our mission, strengthening our market position, and building a strong sense of shared vision) and defined by the three themes that emerged in the planning process: engaging our students, delivering on our promises, and strengthening our strategic assets. In 2017-2018, implementation of initiatives has begun. The framework serves as a roadmap for their implementation and a gauge for measuring progress and success. It is not a fixed plan, but an organic, iterative process where initiatives may generate new initiatives as we move forward with strategic planning always in mind. To keep all of the College’s constituents informed of our plans, the framework’s themes and main initiatives are provided below. Please click the links to view examples of action milestones associated with the main themes. We will build upon our tradition of innovation in our educational programs so that we become a national model for engaged learning. Assure that students find Rollins intellectually and professionally rewarding, with a thoughtful process for selection of major. Establish Center for Global Initiatives, elevating and manifesting our commitment to comprehensive educational preparation for global citizenship. Establish Center for Civic Engagement, elevating and unifying our robust programs in civic and community engagement, social innovation, and social entrepreneurship. Assure that all students engage in experiential learning, creating essential connections between knowledge and practice. Increase options for on-campus student housing, enabling more students to experience the full potential of living and learning in a campus community. We will commit to the academic and post-graduate success of each of our students. Increase commitment to diversity and inclusion, building a campus community that reflects the world our alumni will lead. Assure that students are prepared to make a successful transition from their Rollins educational experiences to their post-graduate aspirations, with an integrated approach to academic, career, and life planning and advising throughout their four years. Renew our commitment to the Hamilton Holt School and its foundation in the essential quality and rigor associated with a Rollins education. We will invest in areas essential to our prosperity and competitive advantage: our people, our workplace culture, our campus, and our strategic information. contemporary business teaching, learning, and research. and creative study of art across all disciplines. Develop guidelines to assure competitive, objectively derived compensation for our talented and dedicated faculty and staff. Invest resources in data analytics, collection, and analysis to improve the integration of our strategic information. ﻿Strategic planning is not an event, or even a process with a beginning and an end, but rather an organizational mindset, a way of thinking about Rollins as a college in a perpetual process of change. With the College's mission squarely in focus, this perpetual process is rigorously informed by research, assessment, data collection and analysis, innovation, and decisive action. President Cornwell’s reflected recently on the College’s new Strategic Framework, it’s initial implementation, and the power of a shared direction. To learn more, read A Shared Vision for our Future. The first StrategyBlocks Planning Progress Reports are now posted to the Blackboard Strategic Planning Site. Members of the Strategic Planning Team are meeting representatives from each Strategic Task Force this month to confirm action items and obtain completion updates. The October 2017 Planning Update Slide Deck is posted on the Blackboard site as well. Additional reports will be posted in early November. Following a process of rigorous research, honest appraisal of our strengths and weaknesses, creative problem solving, and collaborative deliberation, the College's 2017 Strategic Framework was approved by the Board of Trustees on May 12, 2017. A presentation slide deck, Strategic Framework, and detailed Strategic Planning Implementation Matrix are posted to the Blackboard Strategic Planning Site: Strategic Framework page. A Town Hall meeting for the community to announce the goals and objectives for this cycle of planning initiatives was held on May 18, 2017. 2017-2018: Implementation and progress tracking for approved initiatives. May 2018: Formal assessment and review of implemented initiatives. Fall 2019: Renew the process. October-November: Strategic questions framed; task forces named and working. Task forces hold open forums for input and ideas in proposed recommendations. December: Task force progress reports, including recommendations, submitted and posted. Chairs and co-chairs collaborate to coordinate overlapping recommendations. January 2017: Task force recommendations vetted with campus community to create inclusive list of recommendations to advance the College’s mission. February: Sharing and prioritization of recommendations. Faculty governance review and approval for curricular matters, if required. Recommendations shared with the Board of Trustees. March: Alignment of proposed initiatives with resources. Learning outcomes or administrative effectiveness assessment plans for proposed initiatives developed. May: Board of Trustees reviews and approves proposed strategic initiatives. As part of the planning process, four significant capital projects were identified as strategic priorities for the College: renovation of Mills Memorial Hall, a new Student Residential Complex, a new Black Box Theater, and development of an Innovation Triangle that integrates an expansion of The Alfond Inn with new facilities for the Crummer Graduate School of Business and art musem. To see architectural renderings and learn more about progress, please visit the College’s Capital Projects website. Thank you to all members of the College’s 13 Strategic Task Forces for completing thorough and systematic preliminary or final reports in December. 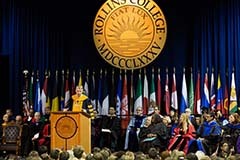 There is no question that these efforts provided substantive guidance in charting the way forward for Rollins. President Cornwell provided feedback to all Task Force chairs and met individually with each group to review the work. Final reports are posted to the Blackboard Strategic Planning Site as completed and Town Hall meetings for community feedback were held in February. After much work and consultation, a methodology and criterion for establishing the College's peer benchmarking group was approved by the College of Liberal Arts faculty in December. To learn more, read the Peer Benchmarking Criterion Whitepaper. The Strategy Team has completed work to analyze fully the campus strengths, weaknesses, opportunities, and threats (SWOT) exercises completed last fall. Campus results are triangulated to independent research studies completed by Generation in the Final Report of SWOT Exercises now posted to the Blackboard Strategic Planning Community Site. Discussion boards are in place and open on the Strategic Planning Community Site in Blackboard. Task force chairs and co-chairs will review and reply to comments posted to the discussion boards. Visit Planning Discussion Boards to pose a question, read comments or learn more. Four strategic planning task forces held open forums to share progress during the first two weeks of November. 1) What should the distribution of majors be? How should we envision what distribution of majors we would like to steer toward? 2) How might we try to move toward an envisioned distribution of majors? During October, updates on strategic planning were presented to faculty/staff, the Faculty Executive Council, the President's Extended Staff, the Alumni Board of Directors, and the Board of Trustees. The sessions focused on a planning process update; results of the recent SWOT exercises, external environmental scan, and competitive admissions analysis, as well as a review of the College's 12 Strategic Questions and Task Forces. Each academic and student affairs department has prepared a brief connecting our educational programs to our institutional mission. The updated external environmental scan for Rollins now available on the Blackboard Community Site (campus log-in required) along with selected higher education literature intended to inform the planning process. Twelve strategic questions grounded in the campus SWOT exercises, informed by the external scan and Admissions market position research data were announced by Dr. Cornwell in mid-September 2016. Task forces have been established to explore these questions and report back to the community as we craft a plan for how best to move Rollins forward.